Orville William Matheny, 98, born in Lawton Oklahoma, passed away peacefully in Gilbert, Arizona on Thursday, January 30, 2014. He is survived by his loving wife, Joy Lee, (married 76 years), 8 children and respective spouses, 39 grandchildren, 57 great-grandchildren. 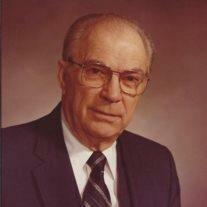 After serving as a Navy pilot in WWII, he participated in the pioneering of the petroleum industry in Alberta, Canada. Orville was a faithful, devoted member of the LDS church. He served as the Texas Dallas Mission president from 1979-1982. Funeral services will be held Wed, Feb 5, 11:00 AM, preceded by a viewing at 10:00 AM at the LDS Chapel, 1150 E Guadalupe, Gilbert, AZ. Arrangements by Bunker’s Garden Chapel. For more information go to www.bunkerfuneral.com.